20 Shades of Narcissism - Book by David Thomas PhD. 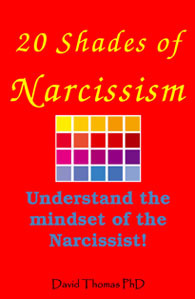 20 Shades of Narcissism gives a valuable insight into why people behave as they do. It looks at narcissism and related issues such as self-esteem, abuse, control, boundaries, moral and ethical behaviour, parenting, nature, nurture, and how the brain develops. Preface (extract from book): Narcissists can seriously diminish the happiness of those around them. The narcissist looks to others in his or her environment for a view that will reflect and confirm how wonderful he or she is. Narcissists don't have high self-esteem, indeed they often feel very empty. Since they find it difficult to live like this, they look constantly to external sources to boost their self-esteem - by draining it from family members, including their children, and from friends, lovers, or workmates. People who have been brought up as trusting individuals are most at risk of being lured in by narcissists. Once narcissists have established what another person believes to be a trusting relationship, they have acquired the power to exploit! The obsessive pursuit to boost their self-esteem brings short-term emotional benefits to narcissists; their anxiety is reduced and they feel better about themselves, but only temporarily. As a result, they are constantly on the lookout for other suitably naive and trusting individuals to manipulate, in order to further bolster their feelings of self-worth. This becomes a constant, never-ending cycle because, since the boosts that narcissists get don't last very long, their demands, sometimes unreasonable and even bad-tempered, continue. Some authors argue that people's self-worth or self-esteem is contingent upon what they believe they need to be, or to do, in order to have value and worth as a person.1 It certainly makes sense that people want to feel worthy and valued. If this is the case, then, narcissists must be no exception. How and where we invest our self-esteem determines our thoughts, our emotions and, consequently, our behaviour. However, for many people, such self-esteem is generated internally; they have no need to extract compliments from others and do not crave their admiration. On the other hand, narcissists invest huge amounts of effort into boosting their self-esteem by drawing on external factors, such as competition, a must-win-at-all-costs attitude, or the approval of others, in an obsessive desire to be liked and admired. This, along with envy and paranoia, is what drives their behaviour. However, research points to the fact that basing self-esteem on external factors can lead to more negative consequences than basing it on internal factors, such as moral virtue. I have encountered and have had to deal with a number of narcissists throughout my life. Probably my first encounter with a narcissist, although I didn't know it at the time, was with my own mother. She was highly competitive, and anyone whom she perceived as being better than she was, or who failed to give her the admiration that she thought she deserved, was either ignored or denigrated. Her brother unwittingly fell "victim" to her neurotic behaviour simply by being too successful. He was a kind and generous man, and she got along well with him until, through his hard work and initiative, he succeeded in his business and became wealthy. From that point on, my mother stopped speaking to him - and this continued throughout the last 13 years of his life. I first encountered a narcissistic boss when I was a teenager working at a large aerospace company. My boss refused to allow me to continue with my college courses, even though it had been agreed at my interview that I would do so. At the time, I didn't understand why he chose to try and stop me from pursuing my education, although I did call in the union and he was forced to rescind. My work and my research have brought me into contact with many other narcissistic individuals, at all levels: bosses, subordinates, and colleagues. As part of the research for my PhD in managerial psychology, I interviewed members of senior management teams, mainly CEOs and directors, and asked them to complete questionnaires. Analysis of the results highlighted just how many senior managers exhibit narcissistic characteristics. The academic research I undertook for my PhD, combined with my own life experiences, has given me an in-depth understanding of narcissism. This book shines the spotlight on narcissism in all of its micro and macro manifestations. It looks at narcissists from a variety of angles: how they think, how they gain control over their "prey," how they become narcissistic, how they manipulate others into feeding their insatiable appetites for admiration, how they envy others, and how their paranoia drives them to take action when, in many cases, no action is needed. Each of the book's 20 chapters examines a different aspect of the topic. Some explore the theoretical aspects of narcissism and some look at the damage that well-known narcissists have inflicted on their businesses or their countries. Other chapters tell true stories about how narcissists have diminished the happiness of those around them, with the names changed to protect the identities of both the "innocent" and the "guilty"! 1. How Do Narcissists Get Away With Abusing Decent People? 5. Are Narcissists Bad People? 6. Can Narcissists Be Emotionally Healthy? 7. Can you Trust a Narcissist or a Co-dependent? 9. Happiness and Depression: Can You Choose? 10. How Does the Narcissist Control People? 11. The Banking Sector: Profit or Moral Justness? 12. Leadership in Twenty-First Century Society: Hitler or Gandhi? 13. A Child's Brain: Is it a Blank Slate Waiting to be Written On? 18. Nature v Nurture: Is Steven Pinker Wrong? 19. Narcissism and Self-Esteem: Is Steven Pinker Wrong? 20. Narcissism: A Life of Deception and Lies?